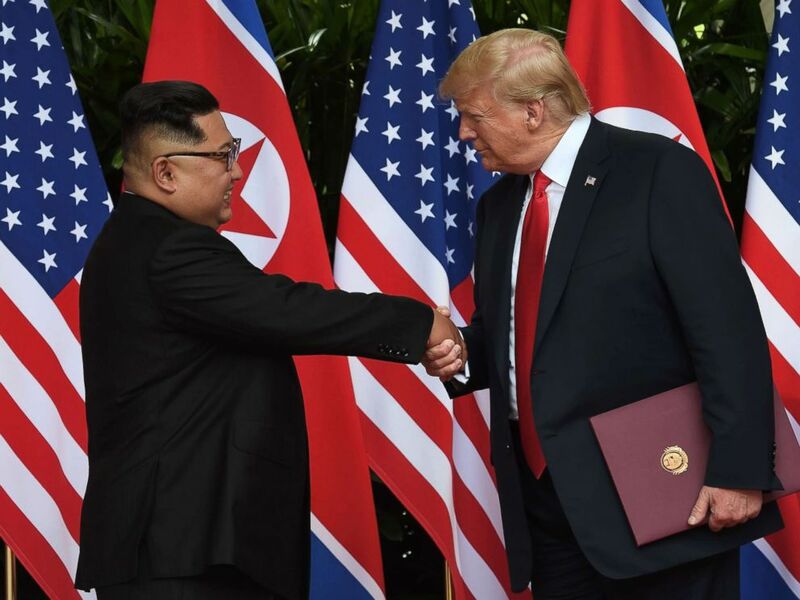 President Donald Trump sat down for an exclusive one-on-one with ABC News chief anchor George Stephanopoulos after the president's summit with North Korean leader Kim Jong Un on Tuesday in Singapore. 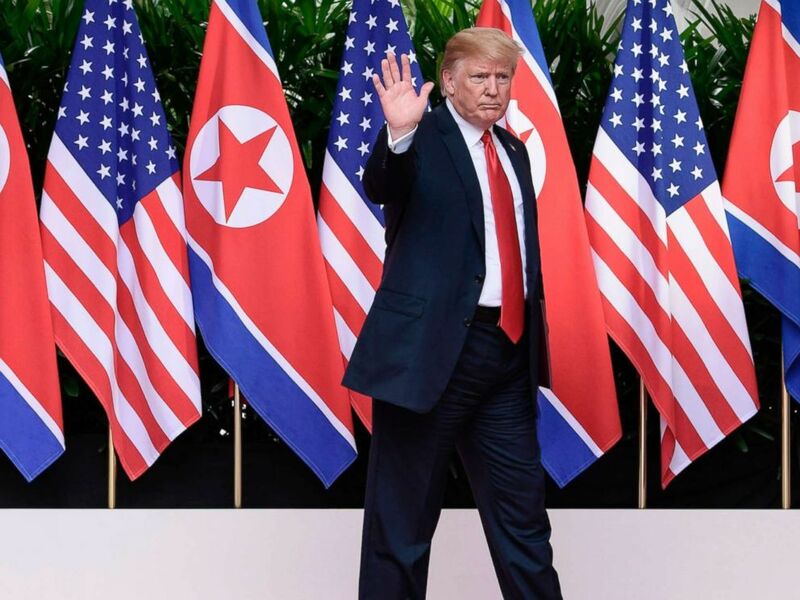 Among a host of topics, Trump said he trusts Kim to follow through on his pledge to denuclearize, discusses how long it will take, the "terrible" Iran nuclear deal and explains the now-viral photo of him facing down Angela Merkel at the G-7 summit in Quebec. T: Yeah, I have spoken, yes, I have spoken to him, I have spoken to a lot of his people, his, as you know, his, I would say very top person was at the White House last week. And so we’ve developed a pretty good relationship in terms of getting something done. It got done. I think it’s a terrific document. It’s a starter, but it’s a terrific document. I think far more -- and there are things that we negotiated after that document that are also very important. 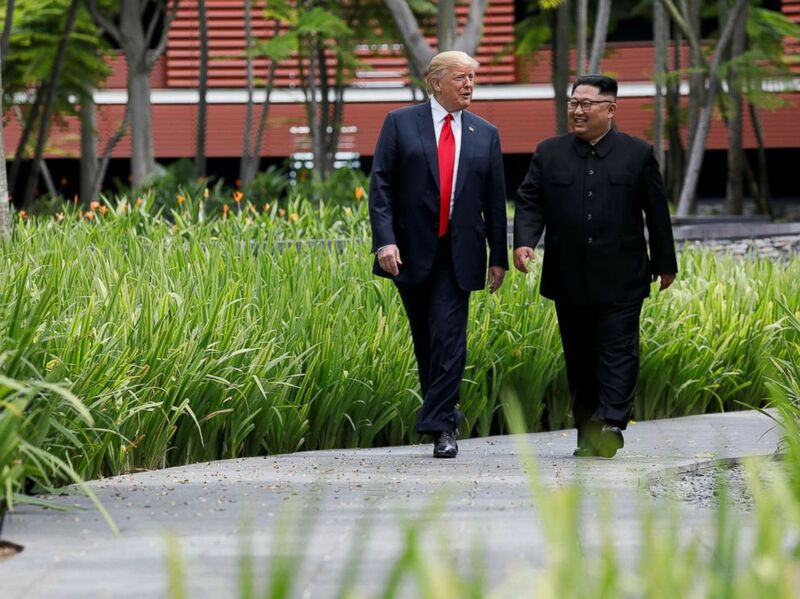 North Korea's leader Kim Jong Un shakes hands with President Donald Trump after taking part in a signing ceremony at the end of their summit at the Capella Hotel on Sentosa island in Singapore on June 12, 2018. T: No. That means that they’re going to get rid of their nuclear weapons. We never even discussed the other. They're going to get rid of their nuclear weapons, George, and I think they want to do it relatively quickly. Now, we're going to see. I mean, they’re going to start working on it immediately. We’re going to work with South Korea. We’re going to work with Japan. We’re going to work with China. But it really has been an incredible exercise. T: Yeah, he’s de-nuking, I mean he’s de-nuking the whole place. It’s going to start very quickly. I think he’s going to start now. They’ll be announcing things over the next few days talking about other missile sites because they were, as you know, they were sending out a lot of missiles. It was a period of time where I was saying, what are they doing? Every week it seems another missile going up. I mean, they're going to be getting rid of sites. T: --process of signing something. Excuse me? T: We didn’t discuss that, no. But we’re not gonna play the war games. You know, I wanted to stop the war games, I thought they were very provocative. But I also think they’re very expensive. We’re running the country properly, I think they’re very, very expensive. To do it, we have to fly planes in from Guam -- that’s six and a half hours away. Big bombers and everything else, I said, ‘Who’s paying for this?’ I mean, who pays, in order to practice. T: Well, we’ve given him, I don’t wanna talk about it specifically, but we’ve given him, he’s going to be happy. His country does love him. His people, you see the fervor. They have a great fervor. They're gonna put it together, and I think they’re going to end up with a very strong country, and a country which has people -- that they’re so hard working, so industrious. I think if you look at South Korea, someday, maybe in the not too distant future, it will be something that. T: George, I’m given what I'm given, okay? I mean, this is what we have, and this is where we are, and I can only tell you from my experience, and I met him, I've spoken with him, and I’ve met him. And this was, as you know, started very early and it's been very intense. I think that he really wants to do a great job for North Korea. I think he wants to denuke, it’s very important. Without that, there's nothing to discuss. That was on the table at the beginning, and you see a total denuclearization of North Korea -- so important. And, he wants to do the right thing. Now, with all of that being said, I can’t talk about -- it doesn’t matter. We’re starting from scratch. We’re starting right now, and we have to get rid of those nuclear weapons. President Donald Trump waves after saying goodbye to North Korea leader Kim Jong Un at the Capella resort on Sentosa Island in Singapore on June 12, 2018. T: Well, you know, over my lifetime I've done a lot of deals with a lot of people, and sometimes the people that you most distrust turn out to be the most honorable ones, and the people that you do trust they are not the honorable ones, so we are starting from a very high plane, we’re starting from a very good relationship. This has been a very big day in terms of the world. I think it’s been, maybe I -- a lot of people have been saying it’s historic. G: -- no president has. T: Right, and he talks about that. He said that, you know, there are reasons he didn't because he was let down by the United States, but that’s irrelevant. What he’s doing, and and he very much said that, he said you know over the years -- first of all, they’ve never gone this far, you know, they’ve never been at a level like this, and his father never dealt with a president, and a lot of other things. But he said, it’s very much on his mind. He said, ‘We are going to get this done.’ In the past we’ve tried, but it never worked out and it never did work out. And it was embarrassing actually to the United states and to our leadership. This is different, I believe you’ll find in the years to come, George. I think you’re going to find this different. T: Well, we’re going to be following things. We’re going to be monitoring things. We’re dealing with him very, on a constant basis. Secretary of State Mike Pompeo did a very very good job, great energy. And they have a great relationship, his counterpart. They have a really good relationship. They’re moving along, they’re getting it done. I mean, I've been up 24 hours now straight between phone calls and working it. This is a very, look this is 72 years we’re talking about, and we put it into one very intensive day and some meetings beforehand. T: Well, I think we have to disagree. Otherwise I wouldn't be here or I would have respectfully, you know, I would have shaken his hand. I would have said, listen, I'll see you sometime. But I wouldn't have had any interest. 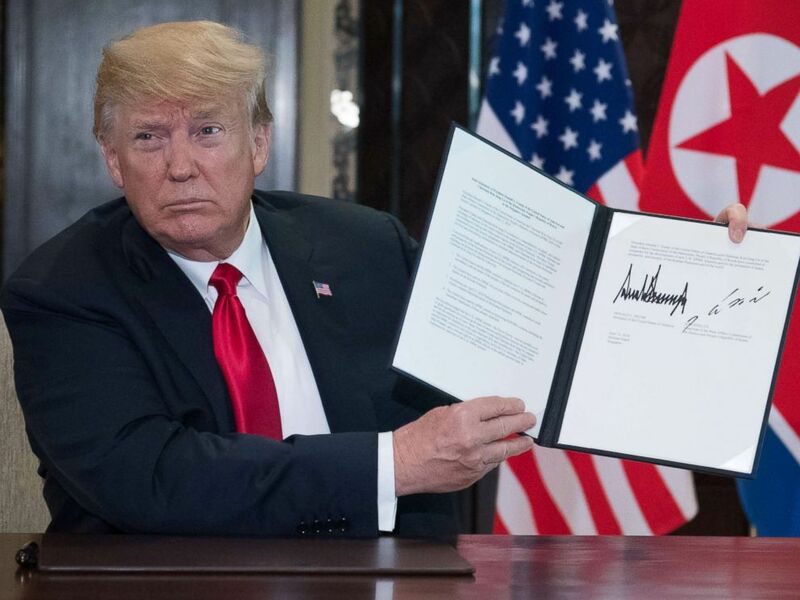 No, this was very important, it’s in the first paragraph and it says complete total denuclearization. Without that I wouldn't have been interested. I believe that he wants to get it done. T: I do trust him, yeah. Now, will I come back to you in a year and you’ll be interviewing and I’ll say, gee I made a mistake? That’s always possible. You know, we’re dealing at a very high level, a lot of things can change, a lot of things are possible. He trusts me, I believe, I really do. I mean, he said openly, and he said it to a couple of reporters that were with him that he knows that no other president ever could have done this, I mean no other pre--he knows the presidents, he knows who we had in front of me. He said no other president could have done this. I think he trusts me, and I trust him. G: You know, you’re reaching out here to Kim Jong Un -- longtime enemy of the United States. Coming off of that summit in Canada with those tough words for the Canadian prime minister. How do you explain that to people who might be confused, that we’re reaching out to our enemies, antagonizing allies. 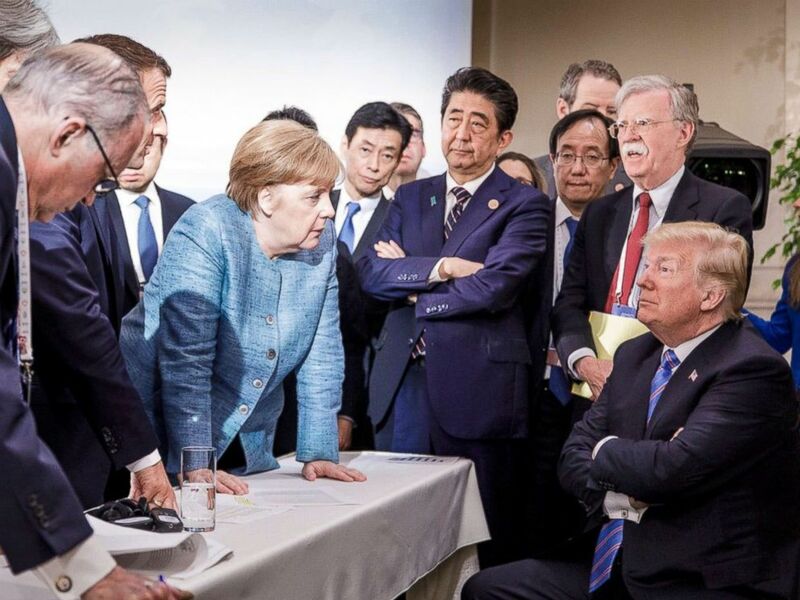 In this photo made available by the German Federal Government, German Chancellor Angela Merkel, center, speaks with U.S. President Donald Trump, seated at right, during the G7 Leaders Summit in La Malbaie, Quebec, Canada, June 9, 2018. T: Right. She was looking at me, you know what we were doing? We were talking while we were waiting for the final copy of the document. That was, that was such an innocent picture. You know, we put out that picture. That was put out by my people. That was really a picture of me sitting this way. And I'm waiting for the document so we can final read it. What happened is we had a final document. I wasn't a hundred percent, but I wanted to leave nicely, so we had a document. I get into Air Force One, the television’s on, and I see a news conference being given by the prime minister of Canada. And Justin. And I said, ‘Oh that’s nice, Justin’s giving a’ -- And then he talked about how they won't be bullied. And I said ‘What’s this all about? He didn’t do that to my face, what’s this all about?’ But here’s what the story is: We have been taken advantage of as a country for decades by friends and enemies both. We have been, our trade is a disaster, our trade deals. We lose eight hundred and seventeen billion dollars was the last count on a yearly basis. Think of it, George. In other words, when you add China and all of the other places, Germany, the European Union is a disaster for us. We lost a hundred and fifty one billion dollars last year. Billion, not not million. We lost a hundred and fifty one billion. They don't take our product. They won't take our agriculture. They won't. We lost a hundred and fifty one. Now they were at the meeting. The European Union. I can't be thrilled. I let ‘em know. And I said, fellas we gotta change it. And if you don’t change it, we’re not going to do trading. T: [interrupting] I just do want to say, though, that picture was supposed to be a friendly picture. That was put out by us. And we were waiting for the document to come back so we could read it. I left, everybody was happy, everybody shook. You should ask Prime Minister Abe. Everybody was happy. And then he gave out a little bit of an obnoxious thing. I actually like Justin, you know, I think he’s good, I like him, but he shouldn't have done that. That was a mistake. That’s going to cost him a lot of money. T: Well, I want to get it along. I want the process to start. I want to see some real work going on, which I believe I will, and I would love to have him at the White House -- whatever it takes, and I would love to have him at the White House, and I think he’d love to be there. And at a certain point when it’s all complete I’d love to be there.